BERKELEY, CA The theory has been around for more than 40 years, but only now has it been confirmed through direct and unambiguous experimental results. Working at the Advanced Light Source (ALS) of the U.S. Department of Energy’s Lawrence Berkeley National Laboratory, a team of researchers has observed the theoretical prediction of electron “spin-charge separation” in a one-dimensional solid. These results hold implications for future developments in several key areas of advanced technology, including high-temperature superconductors, nanowires and spintronics. Spectral data from an ARPES study at Beamline 7.0.1 of Berkeley Lab�s Advanced Light Source revealed the two discrete peaks (blue for the holon and red for the spinon) that form the signature signal of a spin-charge separation event. Just as the body and wheels of a car are thought to be intrinsic parts of a whole, incapable of separate and independent actions, i.e., the body goes right while the wheels go left, so, too, are electrical charge and spin intrinsic components of an electron. Except, according to theory, in one-dimensional solids, where the collective excitation of a system of electrons can lead to the emergence of two new particles called “spinons” and “holons.” A spinon carries information about an electron’s spin and a holon carries information about its charge, and they do so as separate and independent entities. Numerous experiments have tried to confirm the creation of spinons and holons, referred to as spin-charge separation, but it took the technological advantages offered at ALS Beamline 7.0.1, also known as the Electronic Structure Factory (ESF), to achieve success. In a paper published in the June 2006 issue of the journal Nature-Physics, researchers have reported the observation of distinct spinon and holon spectral signals in one-dimensional samples of copper oxide, SrCuO2, using the technique known as ARPES, for angle-resolved photoemission spectroscopy. The research was led by Changyoung Kim, at Yonsei University, in Seoul, Korea, ALS scientist Eli Rotenberg, and Zhi-Xun Shen of Stanford University, a leading authority on the use of ARPES technology. 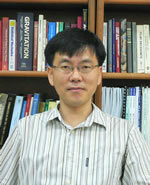 Co-authoring the Nature-Physics paper with them were Bum Joon Kim and Hoon Koh, plus S.J. Oh, H. Eisaki, N. Motoyama, S. Uchida, T. Tohyama, and S. Maekawa. 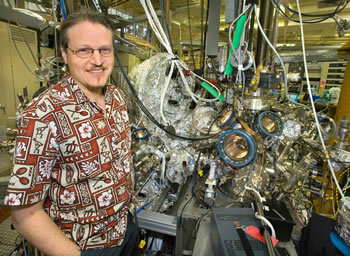 ALS scientist Eli Rotenberg at ALS Beamline 7.0.1, home to the Electron Structure Factory. 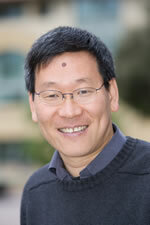 Zhi-Xun Shen of Stanford University is one of the world’s leading authorities on the use of ARPES technology. Changyoung Kim, at Yonsei University, in Seoul, Korea, has spent several years searching for unambiguous evidence of spin-charge separation. Another area in which spinons and holons could play an important role is in the development of nanowires, one-dimensional hollow tubes through which the movement of electrons is so constrained that quantum effects dominate. Nanowires are expected to be key components in future nanotechnologies, including optoelectronics, biochemical sensing, and thermoelectrics. The creation of spinons and holons in one-dimensional systems is also expected to have an impact on the future of spintronics, a technology in which the storage and movement of data will be based on the spin of electrons, rather than just on charge, as with our current electronic technology. Spin-based electronic devices promise to be smaller, faster and far more versatile than today’s devices.